Seven international and regional organisations make this statement in solidarity with the In Defense of Human Rights and Dignity Movement (iDEFEND), Philippine Alliance of Human Rights Advocates (PAHRA), and Task Force Detainees of the Philippines (TFDP). We are deeply concerned about the deteriorating human rights situation in the Philippines. The ‘war on drugs’, has resulted in an estimated 12,000 killings since June 2016 and has been extended until 2022. The government continues to shield the police force from any accountability. We strongly condemn increasing attacks against human defenders and political activists, including the placing of the UN Special Rapporteur on indigenous people’s rights, and other defenders on a terrorist list, and as well as the murder of eight indigenous environmental rights defenders from the Lumad community on 03 December in Lake Sebu, Mindanao, by members of the Armed Forces of the Philippines. We are concerned by attempts to suppress dissent. On 11 January, the Securities and Exchange Commission decided to revoke the registration of Rappler, an independent online newspaper that has reported on unlawful killings in the government’s ‘war on drugs’. This was followed by the President’s decision to ban Rappler from covering Presidential events. We call on the Philippines to: end all killings associated with its ‘war on drugs’; end the intimidation and harassment of human rights defenders and journalists; and cooperate with UN Special Procedures mechanisms. 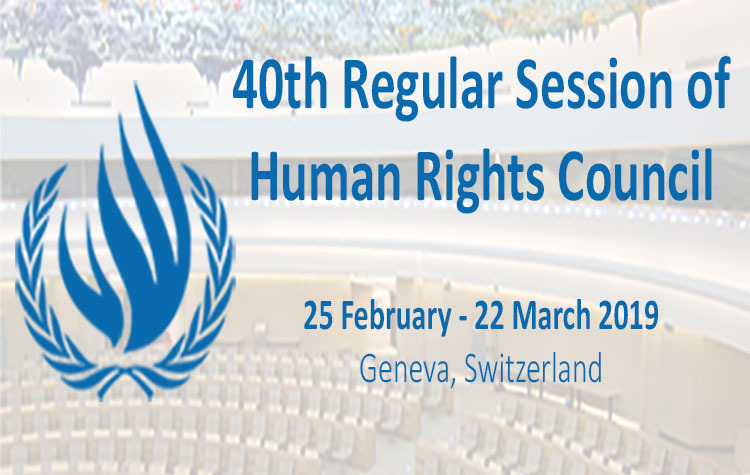 We call on the Human Rights Council to hold the Philippines accountable to standards expected of Council members, and urge the Council to call for the suspension of the Philippines’ membership over failure to uphold these standards. Lastly, while we welcome the preliminary examination of the International Criminal Court (ICC) into the ‘war on drugs’, we also urge this Council to establish an international, independent investigation on the matter.